Bible References: Matthew 27..7–60; Mark 15:42–46; Luke 23.50–53; John 19.38–42. Heart of the Story: Although a secret follower before Jesus’s death, Joseph of Arimathea claimed Jesus’s dead body from Governor Pilate. Back Story: Joseph was identified as Joseph of Arimathea to differentiate him from the many other Joseph’s in the Bible. He was a wealthy man from the town of Arimathea. The location of Arimathea is not clear. Proposed places include in the tribal lands of Ephriam, Dan, and Benjamin; however, more recently the location of Arimathea has been proposed as in Judea. Joseph was a member of the Sanhedrin, the ruling Jewish council; however, he believed that Jesus was Messiah. Joseph of Arimathea asked Governor Pilate for Jesus’s body as soon as Jesus died. Legend proports that Joseph was Jesus’s uncle; but, the Bible provided no data to support the legend. According to Mosaic Law, a dead body had to be buried or entombed the day the individual died or was killed so the land wasn’t defiled (Deuteronomy 21.23). Two other Mosaic laws were pertinent to the burial of Jesus’s body. First, a Jewish man couldn’t work on the Sabbath. Preparing a body for burial was work. Second, an individual who touched a dead body was ceremonially unclean for seven days (Numbers 19.11). Devout Jews internalized these laws. Story Line: As soon as Jesus died, Joseph asked Governor Pilate for Jesus body. After confirming with a Roman centurion that Jesus was actually dead, Pilate released Jesus body to Joseph. Because Jesus died at about 3:00 p.m. and because the Sabbath began about 6:00 p.m., Joseph had a three-hour window-of-opportunity to prepare and entomb Jesus’s body. Along with Nicodemus, Joseph took Jesus’s body from the cross. The two men wrapped Jesus’s body in linen stripes and 75 pounds of mixed aloe and myrrh. The Jewish burial custom of using spices in burial linens was associated with covering the smell of the decaying body. Joseph placed Jesus’s body in a never-used tomb that he had originally prepared for himself. The tomb was located near the crucifixion site so time was not spent transporting Jesus’s body to a location distant from Golgotha. Pondering Relationships: Joseph and his helper, Nicodemus, both devout Jews, knew that they would be unclean for seven days because they touched Jesus’s dead body. Possibly both men would be unable to keep the entire Passover festival because they touched a dead body (Numbers 9.6-14). Further, they could not keep the Jewish Sabbath celebration which started at about 6 on Friday afternoon. During Jesus ministry, Joseph of Arimathea was a secret disciple of Jesus (John 19.38). Yet, after Jesus’s death, Joseph claimed the dead body of Jesus. 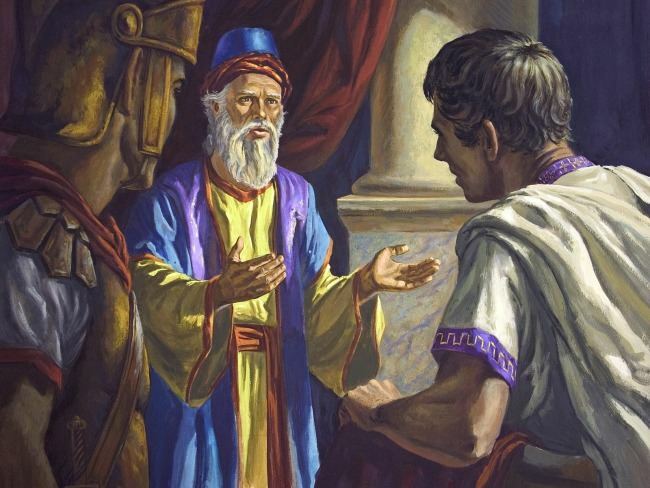 Many Christians in the 21st century ask: “What changed.” Why did Joseph go from being a secret disciple to boldly asking Governor Pilate for Jesus’s body, even going to far as to intern Jesus’s body in his own tomb? My thought is that perhaps Joseph was in a Sanhedrin meeting where the decision was made to advocate for Jesus’s crucifixion. He may have kept silent during the discussion. Alternatively, Joseph may have even agreed that it was better for one man (Jesus) to die than for all of Judea to be attack by the Romans. Reflection: Why do you think that Joseph only declared himself a Jesus follower after Jesus’s death? This entry was posted in Jesus and tagged Bible Study, Jesus's burial, Joseph of Arimathea, Lesser Known Bible Characters, Nicodemus, Obscure Characters, tomb. Bookmark the permalink. A chance too great to missed; a chance too close to ignore. Joseph was silently watching what was happening because he knows his disciples are not bold enough to claim Jesus body for burial. His silence was a wise move so that he could able to give a proper burial.His silence and boldness became a evidence for an empty tomb.